For those of you not familiar with the contemporary art world, the name may not mean a lot, but with galleries in Zurich, New York and London, Hauser & Wirth tops today’s art world power lists and makes Charles Saatchi look like small fry. Those art capitals have had their place in the sun for long enough, now it’s the turn of Bruton, a small town in Somerset, and Hauser & Wirth couldn’t have picked a lovelier spot. Durslade Farm is situated on the outskirts of the town in beautiful grade II listed farm buildings overlooking lush countryside. Sandy colonnade onto Piet Oudolf planting. Rough surfaces in larger galleries, smoother in smaller. Natural materials complement the original buildings. Interior spaces are light and airy. Double doors with views through to the ‘farm yard’. Outdoor spaces are studded with outsize sculpture including Louise Bourgeois’ Spider. Planting is by star landscape architect Piet Oudolf. The original farm comprises an eccentric farmhouse built in 1776 from the local pale blue Lias stone with red brick detailing and beautiful stone mullioned windows purloined, one suspects, from some earlier, grander establishment. The threshing barn is equally antique while other simpler farm buildings were added in the 19th century. 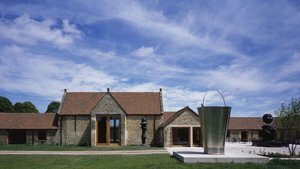 The Argentinian-born, Paris-based architect Luis Laplace has worked alongside local practice benjamin + beauchamp, drawing on the ancient but tough farm architecture to create a variety of gallery spaces, an education room, bookshop, restaurant and bar. Where possible, the fabric and structure of the old buildings have been scrubbed up, repaired and exposed, showing off their inherent utilitarian beauty. In the smaller galleries, where the rough surfaces might detract from the more intimate scale of the artworks, the walls have been plastered and painted white. At present the trusses remain unpainted but the approach is to see what works with the artwork. New buildings form their own ‘cloister’ and use complementary but different materials: rough cast pale grey-brown brick, warm and soft enough when viewed against the original masonry of the farm. The buildings are simple without being arrogantly minimalist, and appear grounded in their setting. High colonnades are formed from sandy coloured precast lintels and columns, picking up on the colour of the lime mortar. Local contractors and craftspeople have been used where possible – particularly successful are the giant doors in chunky oak with huge galvanised steel ironmongery. Inside these new buildings are the sleeker and more controlled spaces, though the usual gallery tropes of shadow gaps and concealed lighting are avoided. After the simplicity, rugged and refined, of the farm buildings and new galleries, the interior of the farmhouse comes as a shock. It is designed as a guest house or home for an artist-in-residence, and Laplace has let his imagination run riot. It features vintage wallpapers, murals, coloured sanitaryware and vivid walls, driven partly by what he found while peeling back the layers of history within the house and partly in response to the artwork around him. This is like the fantasy house of an eccentric relative. It won’t be to everyone’s taste but it does make a refreshing change from the ubiquitous, sleek Babington House style of most nearby accommodation. The outdoor courtyards have striated rough cast flooring, like the cleanest farmyard you could imagine. Perfect for when the Somerset weather turns nasty. The planting by star landscape architect Piet Oudolf is lovely – it looks rather formal in its immature state, but one can imagine the frothy grasses softening things up by September. Walking around the site, one has the feeling that all involved, from the client to the subcontractors, care passionately about the project, in fact you can see gardeners and electricians slightly mesmerised by the artworks as they arrive and the sheer beauty of their current workplace. Laplace has spent a lot of time in Bruton and is now greeted in the high street by the locals who have taken to the gallery and all it is bringing to Somerset. Co-founders Iwan and Manuela Wirth have also made a huge effort to engage with the community in Bruton and neighbouring towns. There is a real sense that this wonderful gallery will become a Somerset asset as well as an international art destination.